WINNIPEG - First quarterMLS® sales and dollar volume market activity are in line with the same period in 2011. This year’s result can only be viewed positively given last year’s first three month’s performance was the best first quarter WinnipegREALTORS® ever had since its inception in 1903. Sales are down 2% while dollar volume is up 3% in comparison to 2011. 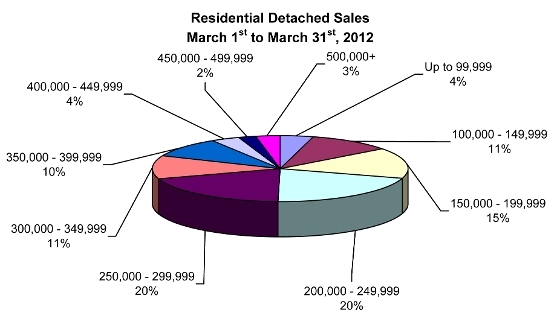 March 2012 was also up against the best March in WinnipegREALTORS® history in 2011 so to be down only 4% in sales and dollar volume respectively is hardly something to fret about. If anything, it can be seen as a bit of a reprieve that will allow more inventory to help moderate the upward market pressure on prices. In fact, going into April, there are 17% or more than 200 active residential-detached listings available for sale than was the case at the end of February. Helping increase supply was the 5% increase in new listings coming on to the market in March. MarchMLS® unit sales were down 4% (1,138/1,186) while dollar volume as well decreased 4% ($264.8 million/$274.9 million) in comparison to the same month last year. Year-to-date or first quarterMLS® market activity shows sales down 2% (2,483/2,533) while dollar volume is up 3% ($589.0 million/$570.5 million) in comparison to the same period last year. While March 2012 will be noted as the first month in many to not see a spread in sales and dollar volume percentages where the latter has been notably higher, it is too early to tell if this will continue. Why? Many market indicators such as days on market and percentage of above list price sales (e.g. 45% in March) show the local market is remaining robust in its overall performance and therefore will continue to push dollar volume to record levels as it has done in previous years. For residential-detached sales in March, the most active price ranges were from $200,000 to $249,999 and from $250,000 to $299,999 at 20% each of total sales. Next busiest price range was from $150,000 to $199,999 at 15%. The average days on market to sell for the most active price ranges was only 17 days. The average days on market for all residential-detached listings was 25 days, 3 days faster than last month and one day slower than March 2011. The average days to sell for condominiums in March was 31 days, three off the quicker pace set last month but 4 days quicker than March 2011. The most active price range by a wide margin in March for condominium sales was from $150,000 to $199,999 with 36% of total sales. Established in 1903, WinnipegREALTORS® is a professional association representing over 1,600 real estate brokers, salespeople, appraisers, and financial members active in the Greater Winnipeg Area real estate market. Its REALTOR® members adhere to a strict code of ethics and share a state-of-the-art Multiple Listing Service® (MLS®) designed exclusively for REALTORS®. WinnipegREALTORS® serves its members by promoting the benefits of an organized real estate profession. REALTOR®,MLS® and Multiple Listing Service® are trademarks owned and controlled by the Canadian Real Estate Association and are used under licence.